Here's cheers to gluten free beers! When Richard Jeffares was diagnosed with coeliac disease in 2015, he thought it spelled the end of his keen interest in craft beer. Instead, it's sparked a new career. During a visit to the United States in early 2017, he tasted gluten-free craft beers on par with the mainly barley- and wheat-based brews he had enjoyed before his diagnosis. "I was blown away. There is absolutely no doubt that you can make great beers without using barley. You're not limited by the malt, you're limited more by the brewer's imagination," says Jeffares, who previously managed environmental consultancy businesses. Returning to Australia, he began hatching a plan to make gluten-free craft beer on Victoria's Mornington Peninsula. TWØBAYS Brewing Co will premiere its range at the Gluten Free Expo in Melbourne in October, with a taproom open to the public later this year. According to Coeliac Australia, the disease affects one in 70 Australians, but around 80 per cent of this number remain undiagnosed. As more people become aware of their condition, Jeffares hopes they will become customers. "We think our beers will appeal not only to the consumer that wants to, or has to, go gluten-free, but many interested beer consumers that want to try beer made out of different grains," he says. "We will have the only gluten-free taproom in Australia," he says. "We plan to have between six and nine beers on tap, so the same huge variety that you'd get at a normal barley-based craft brewery." Of course, the number of consumers going gluten-free by choice rather than necessity is much larger than the coeliac demographic. A CSIRO study in 2016 found that 12 per cent of Australians avoid wheat and/or gluten. An earlier survey by the researcher found that the vast majority of people who avoid wheat do so to manage gastrointestinal symptoms and fatigue that they attribute to these products. Similar trends are driving the rollout of gluten-free beers overseas by brewing giants such as America's MillerCoors, which has launched two gluten-free lagers under the Coors Peak label. None of Australia's major brewers produce gluten-free products, but some labels, such as Carlton & United Breweries' Pure Blonde, employ brewing processes to break down the gluten in malted barley. Such products are typically labelled as "low in gluten" or "gluten reduced". TWØBAYS' Jeffares says there is no threshold to define "gluten reduced", which is why the company has opted to brew with grains that are naturally gluten-free. "We recommend those with intolerances stay away from beers made with barley, wheat, rye and oats even if they are 'reduced'. It's the only way to be completely safe," he says. TWØBAYS makes its beers from gluten-free malts including rice, millet and buckwheat. "Rice gives us a little bit of flavour, but it is mainly there as a production aid, whereas the millet and buckwheat give us flavour and body," he says. Jeffares says his gluten-free beers will be lighter in body, but still very close in style to products enjoyed by craft beer enthusiasts. "In wine terms I describe it as being a bit like a sangiovese versus a shiraz. Sangiovese has slightly different flavours and slightly lighter body [than shiraz], but equally in my opinion, you can make a great sangiovese and a great shiraz," he says. 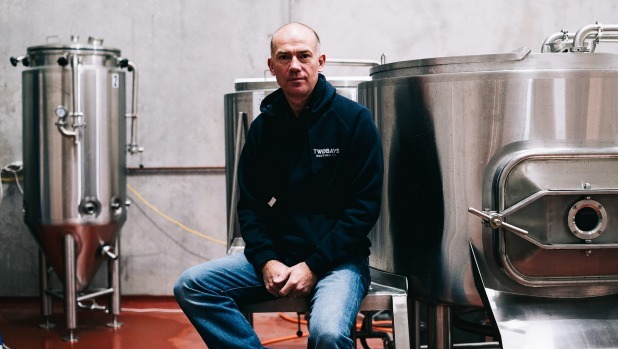 TWØBAYS has appointed Andrew Gow, formerly of respected Victorian breweries Mornington Peninsula and Mountain Goat, as its head brewer. 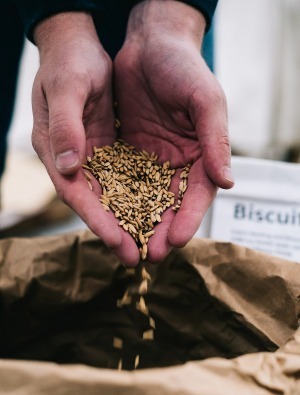 "I think it's useful for us, particularly when we're starting out, to have a person who can go and drink the latest barley-based beers and see how we can potentially replicate them with our gluten-free malts," Jeffares says. "As much as I'd love to go down and try the latest craft beers, I can't and he can." Victoria's Rebellion Brewing is the largest producer of gluten-free beers in Australia. Founder John O'Brien is also a coeliac and his namesake brand O'Brien Beer is distributed nationally through retail outlets including Dan Murphy's and First Choice Liquor. Founded in 2005, O'Brien set out to produce accessible gluten-free alternatives to more mainstream beers, as opposed to the craftier offering proposed by Jeffares at TWØBAYS. "We made a lager and a standard pale ale. The premise when we started was: if you're used to drinking Coopers Pale Ale or VB or Carlton Draught, then you can pick up our beer and it's reasonably similar," he says. O'Brien has recently added a mid-strength lager to the range, and also releases seasonal beers. O'Brien Stout, released for winter 2018, is a full-bodied Irish stout, with specially roasted sorghum and millet malts providing roast coffee and rich chocolate characters. "With the introduction of the only 100 per cent gluten-free stout produced in Australia, we continue to innovate and provide gluten-free beer options equal to any other barley-based beer options," he says. Highlighting current interest in the gluten-free category, the ambitious private equity-backed Sydney company Tribe Breweries earlier this year snapped up Wilde Gluten Free Beer, a fast-growing brand founded by Novocastrians Chris and Narelle Gordon in 2013. "Growth in the gluten-free category has two angles to it," says Tribe Breweries CEO Anton Szpitalak. "For people who have a gluten intolerance, Wilde's use of sorghum to brew beer has opened up beer as a choice that just didn't exist before. "The second is craft beer. We are flavour and experience hunters, and folk are always looking for something new. People are trying new beers more often now than they ever have, so I think that has helped a lot in people trying a product category that just didn't exist before." TWØBAYS' Jeffares says the company's gluten-free status will be front and centre in its branding. "The craft beer market is, in my opinion, pretty saturated and we're not trying to be another player there," he says. "We will absolutely be focusing 100 per cent on the gluten-free market. At the same time, we know that of all the beer drinkers who drink barley-based beers, pretty much everyone will have a friend who's gluten-free. "They'll hopefully spread the word and bring a number of their friends along to try the beers." Jeffares hopes one day to reprise a family tradition he once shared with his brother Steve, co-founder of the hugely successful GABS Beer & Cider Fest, along with Melbourne brewery Stomping Ground. "For many years, wherever we went as a family unit we would always go and find the local brewery in town and sit down to try the tasting paddles," Richard Jeffares says. "For me, it's about bringing that experience to the gluten-free consumers." ​This forthcoming release from the Mornington Peninsula start-up is brewed with malted millet, rice and buckwheat. Expect other naturally gluten-free grains such as quinoa, amaranth and chestnuts to figure in its upcoming beers. Canada's Glutenberg won a gold medal in the World Beer Cup for this gluten-free expression of an India Pale Ale. Citrus hop aromatics sit aloft a grain bill comprising millet, buckwheat, corn and black rice. Available in Australia through selected retailers. ​From Hope Estate in Pokolbin, in the Hunter Valley, comes a pale coloured lager with hints of citrus and spice on the nose. Clean, dry and refreshing on the palate, it finishes with a fruity zing. ​The latest gluten-free beer from O'Brien is in the style of an Irish stout. Specially roasted sorghum and millet malts provide an aroma of roast coffee and rich chocolate flavour. A full, creamy mouth feel gives way to a roasty bitterness with a light sweetness. ​Presenting as a golden pale ale, Wilde is brewed purely from sorghum with aroma hops contributing citrus, pine and floral notes. The finish is bitter but clean and flavoursome. New owner Tribe Breweries is considering adding more GF beers to the Wilde range, which has previously included a raspberry version.